Composed by Frank Martin (1890-1974). Arranged by Hans Bruderl. Score and parts. Composed 1933. Duration 8 minutes. Universal Edition #UE33942. Published by Universal Edition (PR.UE033942). 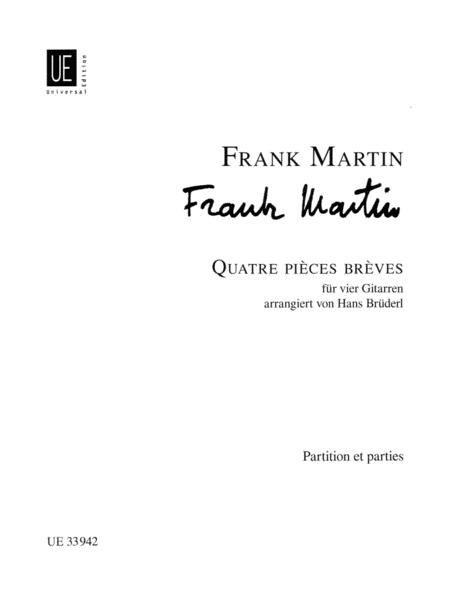 Having long been a part of the standard repertoire of guitar literature for several decades as a solo work, Frank Martin's Quatre PiÃ¨ces BrÃ¨ves is now adapted for a guitar quartet in a meticulous new arrangement by Hans Brudel. The design of the music hints at an orchestral structure that is particularly evident when the parts are divided for several voices, allowing the work to become more transparent in space, creating a new quality that forms the basis of a lively interpretation of chamber music. For advanced players.